is a powerful search plugin for Microsoft Visual Studio. It's the fastest way to search and navigate your source code. The free trial gives you 30 individual days of usage. 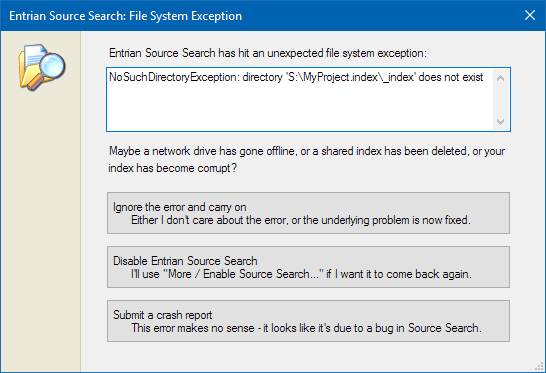 Sometimes, Source Search hits an unexpected file system exception when trying to read or write an index. These can be caused by, for example, network drives going offline, shared indexes being deleted, or indexes being corrupted by Visual Studio crashes or power failures. If you see one of these, please accept our apologies! 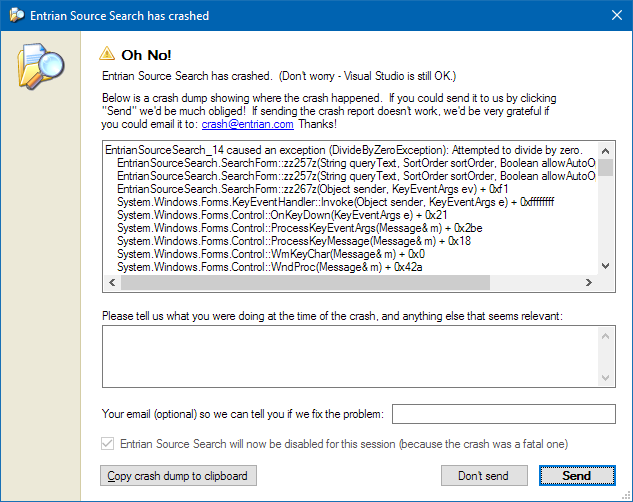 Secondly, please click Send to send the crash report to Entrian Solutions. Every single one of them gets looked at, and we do our very best to fix them. Entrian Source Search makes Visual Studio faster and more productive to use. and try it for yourself.